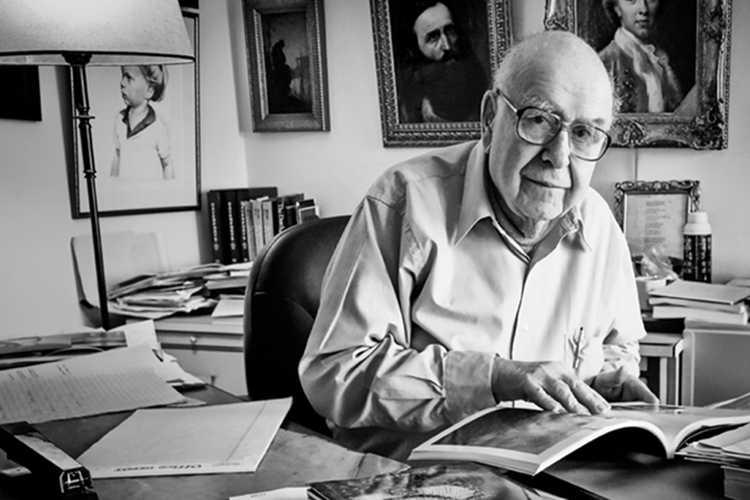 Alfred Bader, CBE, a self-made chemical entrepreneur and an expert on baroque art, died on Dec. 23 at age 94. Together with his wife, alumna Isabel Bader, he was a philanthropist who supported important arts and education initiatives in his home community and around the world. At the University of Toronto, his gifts opened research opportunities to students and contributed to a thriving theatre space at Victoria University. “Alfred Bader will always be remembered as a generous friend of the University of Toronto and an outstanding champion of education,” says U of T President Meric Gertler. “The support that he and his wife Isabel gave to Victoria University has provided undergraduate students with significant financial support as well as more opportunities to learn from world-leading scholars, and to undertake important research in arts and culture. It has also helped to build a vibrant theatre and film community centred at Victoria which radiates throughout the city and indeed around the world. In recognition of their leadership, the university inducted both Alfred and Isabel into the Chancellors’ Circle of Benefactors in 2018. In addition to their years of involvement and philanthropy with U of T, the Baders have generously supported Queen’s University and myriad other causes in Canada, the United States and Israel. Bader was predeceased by his first wife, Helen Daniels Bader. He leaves his second wife, Isabel Overton Bader, sons David and Daniel, and seven grandchildren.